With Readly you can read WordPress Complete Manual and thousands of other magazines on your tablet and smartphone. Get access to all with just one subscription. New releases and back issues – all included. Discover everything you need to know to build your own website! Spend any amount of time browsing the Internet and you will no doubt have been on websites powered by WordPress; from tiny blogs about baking to the huge websites of international companies. Every day, thousands of brand new websites are created using this well-known, hugely trusted and extremely flexible publishing platform and millions more are managed and maintained. WordPress makes it easier than ever to create the perfect site for your business, personal brand, event, portfolio or online store. 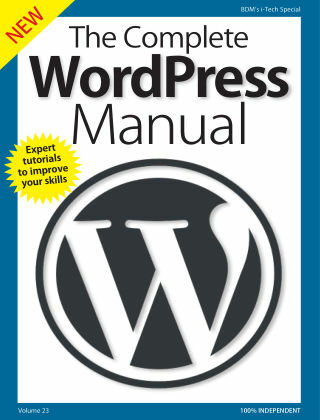 This guide is both an introduction to using WordPress for the first time and also a manual for taking the next steps into website building. 100% unofficial.